Heat the oven to 350 F (180 C). Line the bottom of a 10-by-2-inch buttered round cake pan with parchment paper. Dust the bottom and the sides of the cake pan with flour, and tap out any excess. Sift together flour, baking powder, and salt, and set the bowl aside. In another bowl, cream butter with an electric mixer on medium speed until fluffy. Gradually add sugar, and keep beating until the mixture is fluffy and light in color (about 3 minutes). Then drizzle in eggs, beating on medium speed until the batter is no longer slick. Beat until the mixture is fluffy again, about another 3 minutes. Then, add flour mixture and sour cream alternately to the batter, a little of each at a time, starting and ending with the flour mixture. Beat in vanilla. Pour the batter into the pan. Bake cake in preheated oven until the top has turned golden brown, and a toothpick inserted into the center comes out clean, about 40-50 minutes. Rotate the pan in the oven, if needed, for even browning. Transfer cake pan to wire rack to cool, about 15 minutes. Remove cake from the pan, and let cool completely on the rack, top up. To assemble, remove parchment paper from the bottoms of the cake. Split the cake in half horizontally with a serrated knife. Set aside the prettier dome for the top layer. Place the other another layer, dome side down, on the serving platter. Use a fork to poke all over the top of the cake, in 1 inch intervals. In a small bowl, stir together the coconut milk, and sweetened condensed milk. 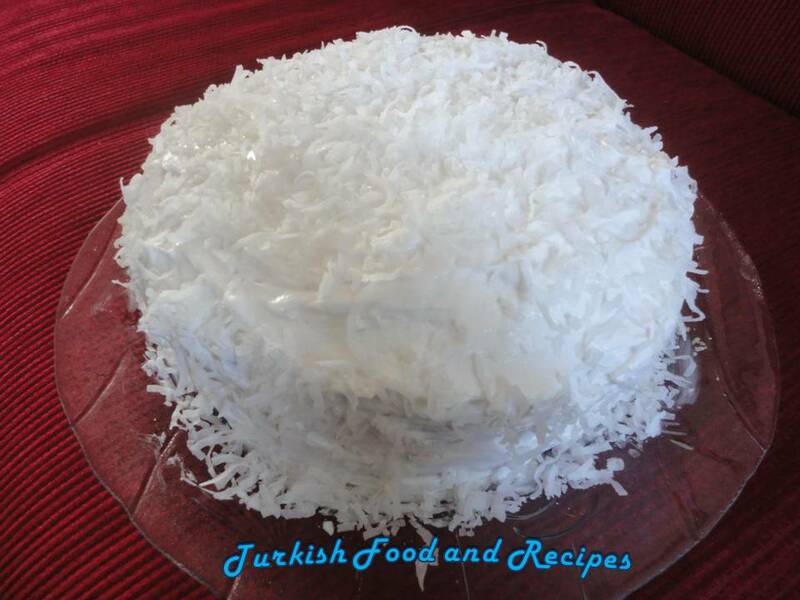 Evenly pour half of the milk mixture over the cake, then sprinkle with 3-4 tablespoons of coconut flakes over the cake. Let it absorb the liquid for 15 minutes in refrigerator. 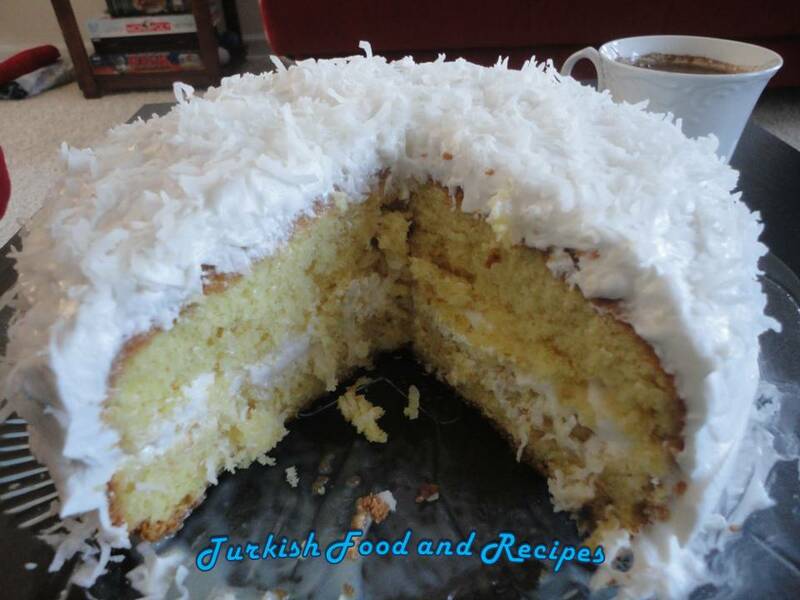 Then, spread a generous 1 cup of whipped cream over coconut flakes. Top cake with the reserved domed layer, and poke all over with a fork, in 1 inch intervals. Pour the remaining milk mixture evenly over the cake. Sprinkle with 3-4 tablespoons of coconut flakes over. Chill cake in the refrigerator until cold, about 1-2 hours. Frost outside of cake generously with whipped cream and sprinkle remaining coconut flakes all over cake including the sides while frosting is soft. Keep refrigerated. Firini 180 C (350 F)’a isitin. Yaklasik 25 cm capinda ve 5 cm yuksekliginde bir yuvarlak pasta kalibinin dibini yaglayip, uzerine yagli kagit serin. Kalibin dibini ve kenarlarini unlayin. Fazla unu silkeleyip atin. Genis bir kasede un, kabartma tozu ve tuzu karistirin. Baska bir kasede oda sicakligindaki tereyagini orta hizli mikser ile krema haline getirin. Yavas yavas sekeri ilave edin ve karisim beyazlasip, kopuksu bir kivam alana dek mikser ile cirpmaya devam edin (yaklasik 3 dakika). Sonra, yumurtalari ilave edin ve orta hizda karisim tekrar kopuk su kivama gelene dek cirpmaya devam edin (yaklasik 3 dakika). Sonra, sirayla un karisimini ve kremayi azar azar ilave edin. Un ile baslayip un ile bitirin. Cirmaya devam ederek vanilyayi da ekleyin ve son olarak kek karsimini pasta kalibina dokun. Kekin uzeri hafifce kizarana kadar firinda pisirin (yaklasik 40-50 dakika). Kekin pistigini anlamak icin orta kismina kurdan batirarak , kurdanin temiz ciktigindan emin olun. Eger gerekirse keki firinda cevirerek her yerinin esit kizarmasini saglayin. Pisen keki yaklasik 15 dakika sogumaya birakin. Kek kalibindan keki cikarin ve alt kismi ustte kalacak sekilde iyice sogumaya birakin. Kekin dibinden yagli kagidi alin ve tirtikli bir buyuk bicak yardimiyla kekin tam ortasindan paralel olarak keserek iki pasta keki elde edin. Daha duzgun olan parcayi pastanin uzeri icin ayirin. Diger kek tabakasini servis tabagina alin ve bir catal yardimiyla uzerinde yaklasik 2 cm araliklarla delikler acin. Kucuk bir kasede, hindistan cevizi sutu ve konstantre sutu karistirin. Karisimin yarisini esit sekilde kekin uzerine yayin. Yaklasik 3-4 yemek kasigi hindistan cevizi rendesini uzerine yayin ve buzdolabina koyarak yaklasik 15 dakika kekin karisimi absorbe etmesini bekleyin. Sonra, yaklasik 1 su bardagi kadar krem santiyi bolca kekik uzerine yayin. Diger kek parcasini uzerine yerlestirin ve yine catalla 3 cm araliklarla delikler acin. Geriye kalan sut karisimini esit sekilde uzerine yayin ve yine 3-4 yemek kasigi hindistan cevizi rendesini her yerine yayin. Buzdolabinda yaklasik 1-2 saat sogumaya birakin. Sonra, pastanin uzerini ve yanlarini bolca krem santi ile kaplayin. Son olarak, pastanin her yerini, yanlari da dahil olmak uzere hindistan cevizi rendesiyle kaplayin. Hindistan cevizli pastanizi buzdolabinda saklayin. I wish I was there to share a slice of that absolutely gorgeous cake.